Weed detection can be a difficult task, especially if weeds are similar and at the same development stage as crops. Through a unique approach with the weeds layers on Atlas, a vineyard in California’s Central Valley reduced the cost of weed detection by 50 percent, while improving crop quality. 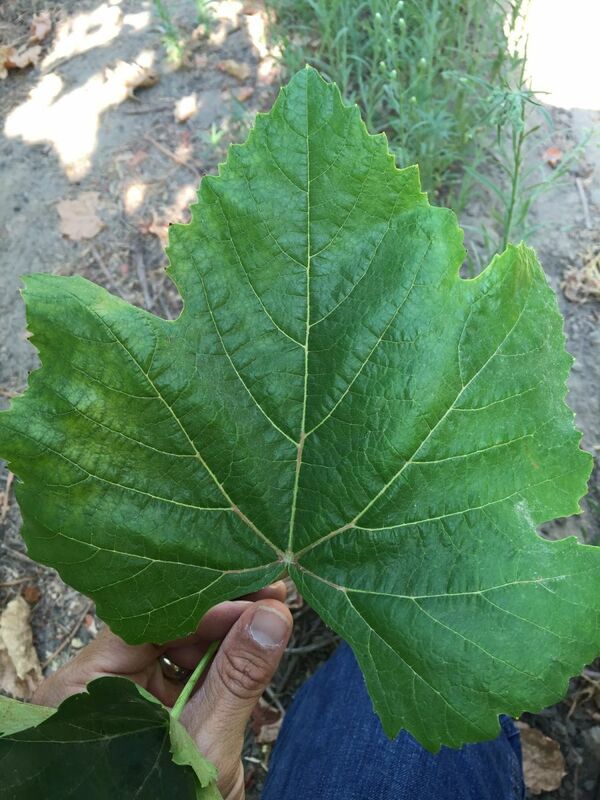 Weeds, in the form of “volunteer vines” present a distinct challenge to grape growers. The word volunteer is commonly used to refer to vines of a varietal different from what was planted or grafted in a field. Occasionally, new growth from below a grafted union will be established, and the new vine shoot will be trained in place of the desired scion wood. Buried in the field, and growing in the same way as the remainder of the field, these vines can be difficult to spot. From the perspective of a crew member picking grapes, the volunteer grape is identical. Color, berry size, bunch size, and time of maturity are the same. (Mature purple grapes from volunteer vines). Once established, volunteer vines can carry a negative impact on farming operations, since volunteers, like any other weed, are competing with planted crops for water, nutrients, light, and space. Moreover, the volunteer vine produces a sour and seeded fruit unsuitable as a table grape, but that can end up being picked and marketed as such, causing customers and distributors to become weary of purchasing from that grower. 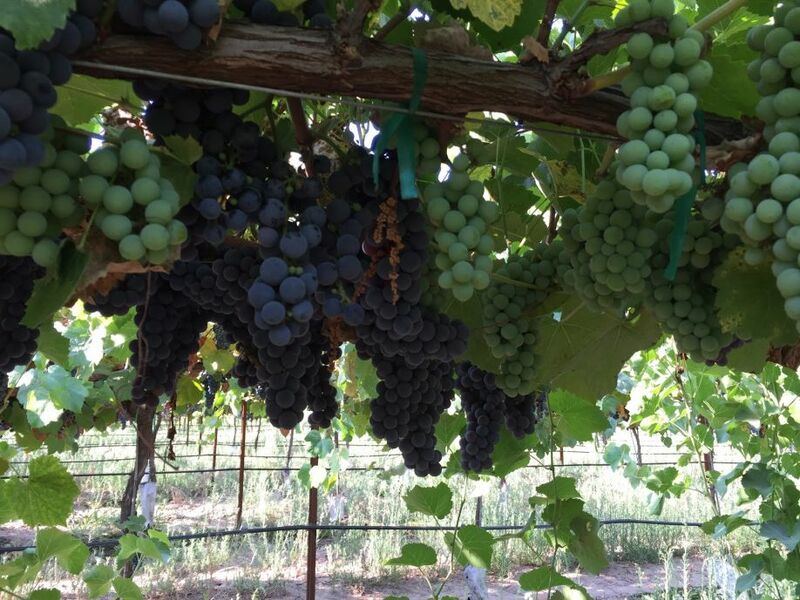 For one particular ranch in Central Valley, California, the presence of volunteer vines has been an item of concern since the volunteers exists with grapes that look identical to, and mature at the same time as the planted variety. The ability to differentiate and identify where these vines exist has become a priority for this grower, and using layers within MicaSense Atlas has become a key strategy in spotting and removing volunteer vines. Planted variety on the above with less shine, and lower chlorophyll levels. Volunteer vine leaf below. 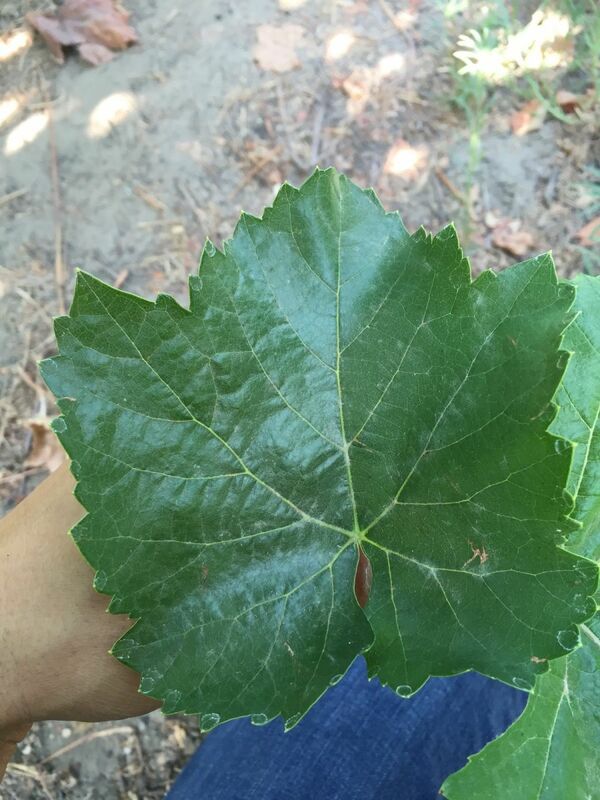 Looking closely at the vines, it is noticeable the volunteer has small, smooth, and glossy leaves with tight bark. In contrast, the planted variety has larger, softer leaves with more of a matte texture, a lighter green appearance, and loose bark. Those differences are hard to see at glance, but Chris Thiesen from Ag OnPoint, Inc, realized the greenness variation between the two types of leaves could be something easy to identify using multispectral data. He proposed mapping the field using the MicaSense RedEdge, and analyzing the imagery collected in MicaSense Atlas. Using a field where volunteer vines had already been spotted on the ground, the first step was to identify, mark, and GPS tag the volunteers in Atlas. Then, the Atlas workflow would be applied to a different field where the volunteer vines had not yet been identified. The weed detection layers in MicaSense Atlas are designed to help growers identify and differentiate weeds from planted crops based on plant chlorophyll content. Each layer has a different combination of bands and color composite that not only make it possible to differentiate between plant types but can also help in early chlorosis detection. Using the Weeds1 layer, which identifies variation in chlorophyll content, Chris and his team were able to identify all the marked volunteers and even spotted an unknown volunteer vine at the northeast corner of the field. The Weeds1 layer highlights the volunteer vines in brighter red due to the higher chlorophyll content. With a method in place, Chris and his team mapped and detected 26 more potential volunteer vines in a second field, 18 of which were confirmed as volunteers. As for the remaining eight, three were Johnson grass, and five were the planted variety with above average health. The weed detection layers used by Chris not only proved effective in identifying the volunteer vines, but also resulted in reduced cost. Having a scout walking one of the smaller fields and manually identifying the volunteers would have cost a total of $525. Instead, using RedEdge and Atlas cost $250, saving the ranch $275 and preventing a significant yield loss. While $275 doesn’t sound like a lot, not correctly identifying and controlling the volunteer vines would have been detrimental to the vineyard, not only for the impact on yield but the potential loss of customers and distributors for the upcoming seasons. 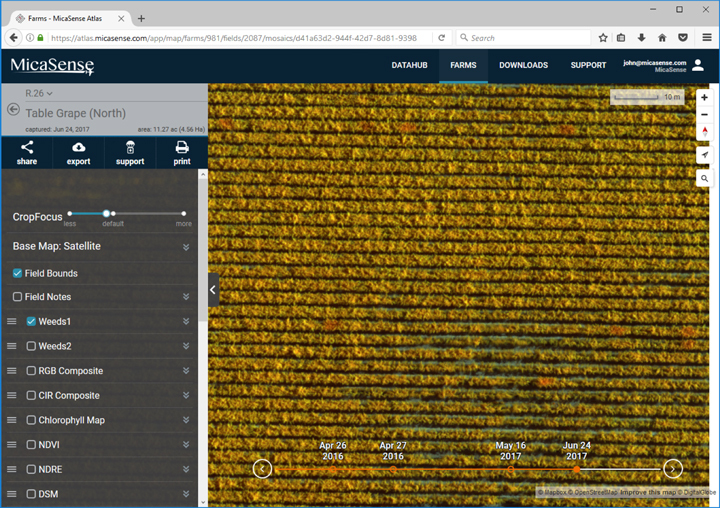 The use of Atlas can help farmers make more informed decisions, better allocate their resources, be more efficient in farming operations, and implement the right strategies that would result in yield and quality improvement.